Posted on April 26, 2015 by Michele D.
We recently went through a kitchen remodel that took way longer than expected. 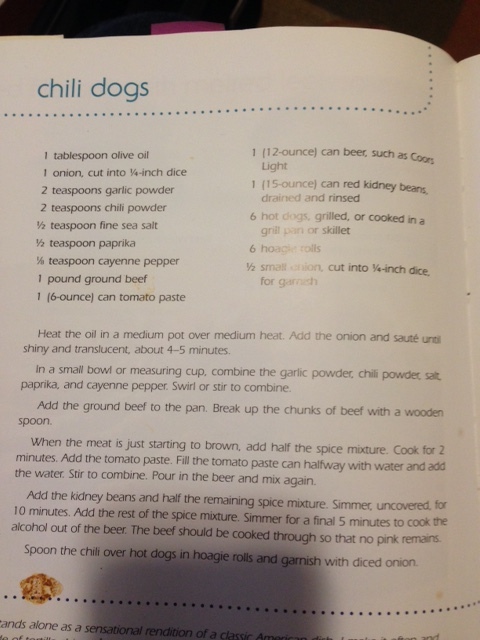 When our kitchen was finally finished, I immediately jumped into cooking action by making all of our favorite comfort foods, one being chili dogs. It was a weeknightt, and I needed an easy recipe that I could make quickly so I turned to Susie Fishbein’s Kosher by Design short on time cookbook. Yes, that’s a food stain at the bottom of this well-loved page in Susie Fishbein’s Short on Time cookbook. There was a lot of chili leftover so a few days later, I made an attempt to turn that comfort food into another one of our favorite comfort foods – tacos. I used the chili from the first recipe but added 1 package of Ortega taco seasoning mix (Circle K Kosher) and a bunch more salt and garlic powder. I then let the whole mixture simmer for 30ish minutes on the stove. The newly created “taco sauce” was still more watery than normal, which made it very messy (hence the name Sloppy Tacos) but my family, me included, LOVED it. The taste was amazing, and more importantly, I was thrilled to be able to salvage the less-than-great chili. To go along with the tacos, I purchased the pre-packaged chopped peppers and onion mixtures at the Whole Foods on Preston and Forest in Dallas. Thanks to the wonderful folks at Dallas Kosher and to the equally wonderful folks at Whole Foods, the Preston/Forest location now offers several different pre-packages (washed/cut-up) fruits and vegetables that are certified Kosher. Eating this sloppy combination was a bit challenging but the flavor was delicious. 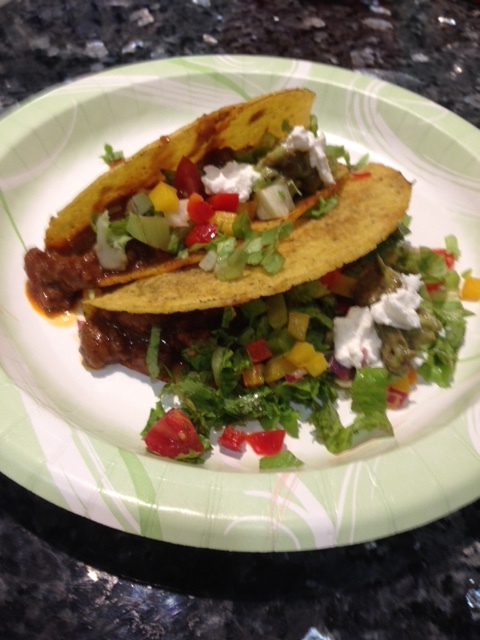 The Kosher Sloppy Taco is now my go-to dish for leftover chili. What’s your favorite way to use leftovers? Posted on April 14, 2013 by Michele D.
Last Shabbos, my sister-in-law called me with an offer I couldn’t refuse. She invited herself for Friday night dinner AND offered to come early and help me cook. I had forgotten how much fun it is to have someone else cooking with me in the kitchen. We had a wonderful time, and she prepared Bumya, which I’ve had before but didn’t know it actually had a name, and Basmati Rice, which I can never stop eating when it’s around. Delish! Chop up some onion if you want and brown in some olive oil. 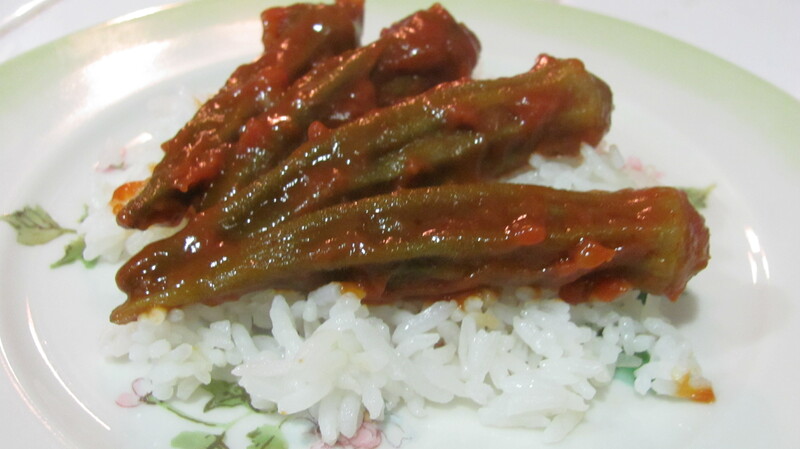 If you are not using onion, then just put the whole okra (we used fresh) in a pot with olive oil. Let the okra cook until it is bright green. Add ketchup, a little onion soup mix and a little bit of water. Stir and let cool on medium heat. Don’t let it burn on the bottom. When the okra is soft, it’s ready. The longer the better. I grew up eating okra so I’m definitely a fan but in the South, there was only one way to cook it – Fried! 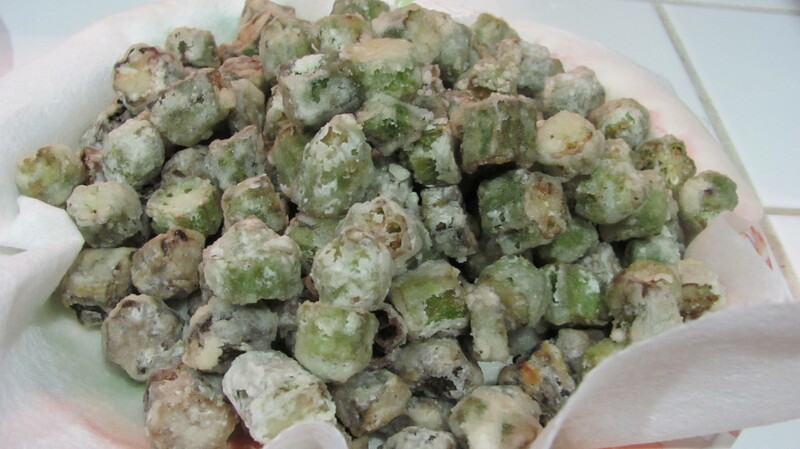 My mother used to make fried okra for us on special occasions, and Rosie’s Bumya inspired me to do 2 things: branch out and add Bumya as one of my favorite ways to prepare okra (Pickled Okra is another fav) but also to give the fried okra a try. I’ve never cooked it before myself and honestly couldn’t even remember how my Mother made it. So I got out my trusty Southern Living Cookbook and sure enough, there was a very simple recipe. Wash okra well; drain. Cut off tips and stem ends (I actually used the stem ends because that’s how my Mother used to cook it); cut okra crosswise into 1/2-inch slices. Roll okra in cornmeal (okra should be very damp for cornmeal to adhere), and fry in hot oil (375 degrees) until golden brown. Drain well on paper towels. Sprinkle lightly with salt. Yield: 4 servings. I fried the first batch way too long waiting for them to turn golden brown. They never did. They still tasted OK but were a little chewy. The second batch, I only cooked for 6 minutes and they were much better. Overall, I think the okra could have used some more seasoning as well. They were definitely not as good as my mom’s but also not bad for my first try. Every single piece of okra was eaten. Happy Southern Kosher Treif Cooking!